Discussion in 'BMX & Dirt Jumping' started by Bike info check, Apr 16, 2013. I am looking for a LG or an XL dirt jump bike. I am 6'4" and about 205. I had a P.1 , I fell in love with the geometry but it was too small (and ss). I found someone selling a 21.5" 2005 G.F. G.E.D. for $600.00. Is that going to be my best bet? I was looking at the Azonic Dirt Dingo frame xl pro but (from some discussions on this site) there is some headset size confusion. I will take any and every suggestion offered . I don't think the used frame would be the right choice simply because the 21.5" top tube is pretty short. Shorter than my 24" bmx which has 22'' top tube. also it is 8 years old , got to be fatigued . The Transition Trail or Park (2012 and prior, they stopped making it for 2013) came in a Large, 23" top tube. Typically, Small is 21.5"tt, Medium is 22", Large is 22.5", and XL is 23". Several companies do 22.25" right in between M and L.
The Rocky Mountain Flow DJ was offered in a Large, complete, that ended up being good for tall guys. STOUT Bicycles custom makes frames. STANDARD bicycles also custom makes DJ frames. Typically, newer dirt jumpers are measured in the same way as BMX--by the actual top tube length (not "effective top tube." This isn't necessarily an exact indicator though, because the seat tube angle can throw off comparisons. 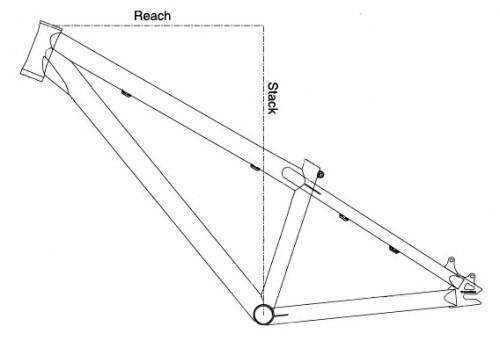 TRANSITION Bikes (wisely) used to post this diagram of "reach." It indicates how close your grips feel when you're standing up. Sitting down is not that relevant. Were you saying you didn't want singlespeed ? Most DJ bikes are singlespeed these days. You could go with a 4-cross type bike like the TRANSITION Bank, if you want gears. An older Giant STP with gears might be good, but I don't think the Large was necessarily that much larger than the Large P1. Which P1 did you think was too short? Was it a S, M , or L ? Those P bikes sometimes came with super short stems, like 40mm reach. If you switched to 53mm reach, like some bmx stems, with chromoly 7/8" clamp bars like Blackmarket Molly Hatchet then you could make it roomier. In the add it is listed for guys over 6'. Yes, I did not like the SS on the p1. I hated the ride to the track that I rode at. It may have been the combination of a small bike that was SS. I think the P1 was a large. I bought it off a guy I met snowboarding for $350.00. I'm 43 (gears help) and I started riding single track with my 8 year old. I like the option of being able to switch gears when approaching different obstacles. I HATE the xc mtn bike geometry for single track. When you are tall, it is like riding road bike. The other reason I am looking at DJ bikes is my kid has a 24" trek 220 (?, it has that geom.). I can absolutely flick that thing around (+ get Idolized by my kid), to the point where I need to find a bigger one for myself so we can both enjoy it. Thank you for the info I will also look at the bikes you listed. I'm 6' 4" also and around 195 lbs. A friend of mine owns his own frame business down in Portland, OR. He builds all kinds of custom frames - but he does a 'stock' frame of his design that he offers for a lesser price than a full on custom mtb/road frame. The stock frame he sells is a DJ frame - hes been building them for a long time. His name is Oscar and he runs Simple Bicycle Co. His DJ's are sweet and I've been thrashing them for over a decade. Should be a link to some pics of my bike in my signature, I think even a link to his webpage, if it still exists. If your interested shoot me a PM and I can give you his contact info. There it is ,custom Simple, says it all doesn't it. 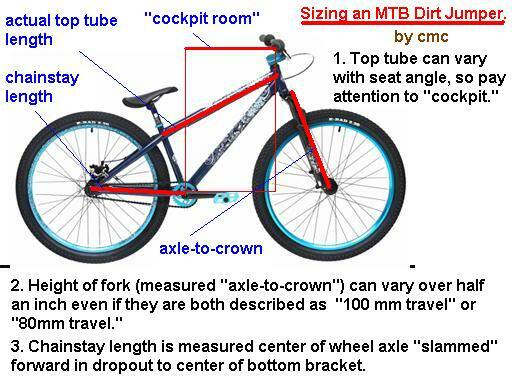 The traditional road and xc mountain bike measurement is seat tube height. 13, 15, 19, 21.5 etc. A 21.5" seat tube would be IMPOSSIBLE for DJ. I broke my Banshee Pyre so I am now building up a Dirt Dingo from the parts. My 1 1/8 Chris King headset didn't fit so I ordered a Cane Creek IS-3 tall and the 29.8 seatpost I ordered didn't fit(thanks for the misdirection, Azonic) so I have now ordered the 27.2 Azonic post for it. I can't find my Profile cranks in the basement now so I pray the RaceFace/Evil 2-ring + bash with splined BB will fit, at least.